If you’re just joining us, we are celebrating love all week long in honor of Valentine’s Day and my upcoming 10 year wedding anniversary! Because we love everyday not just on February 14th, right? We kicked off LOVE Week with our LOVE that Dress Giveaway from Shabby Apple followed by a lovely San Fran wedding that is so good it deserves two posts. Today is the second half and well, we saved the best for last. The Cake! It’s easy to see why I LOVE this cake! Thanks again to Tanja Lippert for sharing her stunning photography with us! You can see more of Tanja’s incredible work on her website and blog. You can also see more fabulous cake creations by I Dream of Cake on their website and in our Top Tier Directory. And remember, TODAY is the last day to enter our LOVE that Dress Giveaway from Shabby Apple! Who wouldn’t love to have one of these gorgeous dresses?! We’ll announce the lucky winner tomorrow. So lovely! 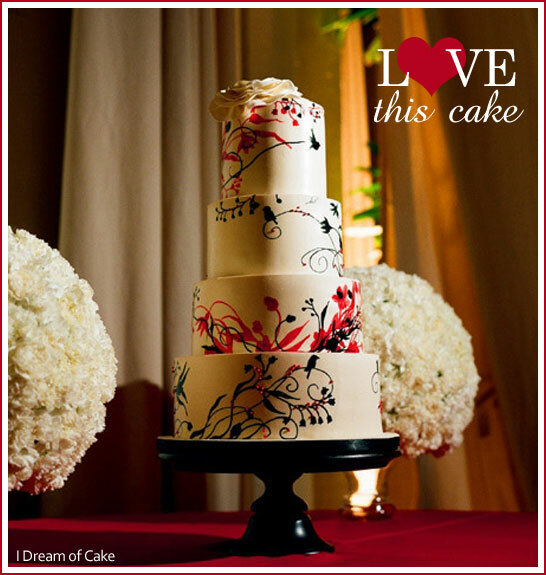 I Dream of Cake is one of my favs too! This is just stunning. Love the whole wedding!